Russia's newest unmanned aerial vehicles (UAVs) are to be equipped with a new system adapted to 'hybrid warfare' that has been developed by Rostec's United Instrument Manufacturing Corporation (OPK), the company's general director Sergei Sokov told RIA Novosti. 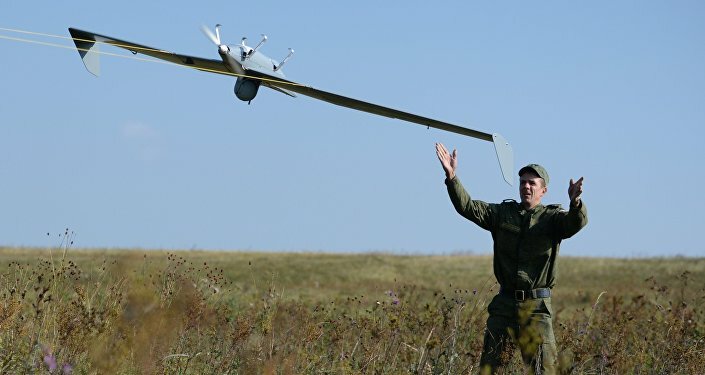 The new system allows for an exchange of information between command posts and individual UAVs in real time without a ground-based intermediary, allowing for a quicker response time, according to Sokov. The new system is being implemented on the Korsar reconnaissance UAV currently undergoing flight tests. "OPK has completed work on on-board radio-electronic equipment created in the spirit of the context of 'network-centric warfare.' This innovative system is a base for building unmanned aerial vehicles, which could be integrated int modern automated battle control systems," Sokov told RIA Novosti at the Ministry of Defense Innovation Day expo. Sokov added that the system includes an unplatformed inertial navigation system, an onboard recording system and a software-defined radio system. The onboard radio-electronic equipment developed by OPK is universal and can be installed on any type of UAV. Network-centric warfare is a military doctrine oriented toward elevating military capability through information and communications dominance and unifying battle participants into a single network. The doctrine is considered to be part of what is called hybrid warfare.